The city of Ro Canarn burns. With their father's blood fresh upon the headsman's sword, Lord Bromvy and Lady Bronwyn, the last scions of the house of Canarn, face fugitive exile or death. In the court of Ro Tiris, men fear to speak their minds. The Army of the Red marches upon the North. Strange accidents befall those who dare question the King's new advisors. Those foolish enough to speak their names call them the Seven Sisters: witches of the fire god; each as beautiful and as dangerous as a flame. And, called from the long ages of deep time by war and sacrifice, the children of a dead god are waking with a pitiless cry. 'Martin meets Lovecraft ... Fun and refreshingly direct' SciFiNow. 'Interesting and enticing, deftly sidesteps fantasy cliche and thrusts you towards the next instalment' SFX. 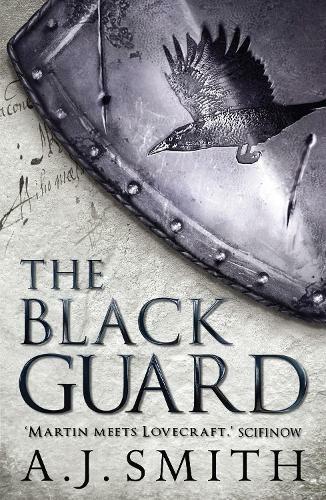 'The Black Guard has been described as "Martin meets Lovecraft", and doesn't disappoint on either count. With bleak personal stories of loss and hardship, wars between rival nations and a plot to resurrect a dead god, the novel is packed with action and intrigue' 7/10 Fantasy Faction.